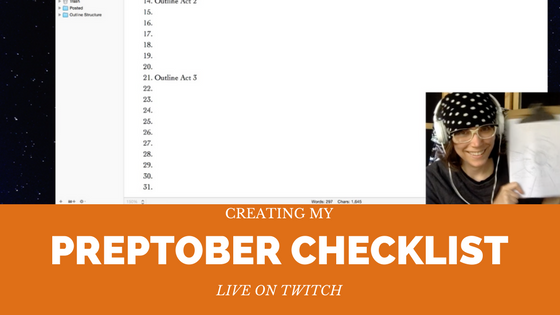 Be sure to check out the video at the bottom of the post where I created this checklist live on Twitch (edited shorter for YouTube), and if you’ve come here from that video or the lifestream, hello! It’s October, the month of Halloween! I’ve got out my spooky but sparse trinkets (moving across the country leads one to cull their holiday decorations) and I’m ready to start planning my NaNoWriMo novel. I’ve pantsed and plantsed the previous four NaNoWriMo novels, so for the first time, this year I am attempting to fully PLAN my story. Yes, no half-filled-out outlines, no ‘insert character here’, I am going to fully prepare myself as much as this month will allow. Here is my checklist! Note, there is an item for each day of October, you can do one on each day (sorry for the late start) or mix them up, do a few on one day, take breaks. Whatever works for you! Another Note: This list is assuming you already have a vague idea of what you want to write about, genera picked, and some brainstorming written down. Third Note: This is my list, so some of the programs, outline structures, will be different from what you end up doing. Use mine as a basic outline and adapt it to what your working with. 2. Set up your Scrivener file. 4. Decide on a plot structure to follow and fill out the basics of it. 7. Make a list of character names and name ideas. 9. Get a ‘writing candle’ to light when I write. 10. Research photos for character/setting inspiration. 16. Write a list of all needed secondary characters. 18. Write one paragraph outlines for all secondary characters. 19. Complete character questionnaires for the main characters. 21. Research local NaNoWriMo write-ins. 22. Fill out a world-building questionnaire. 24. Plan rewards and reward system. 25. Think about meals for November and make some plans. 28. Stock up on snacks/coffee/tea/treats for November. 30. Plan a writing routine and schedule.